Many Americans whose memories reach back to the Dark Ages of Gulf War 1 remember the "incubator babies" story: according to a weepy testimony of a Kuwaiti "nurse," Saddam Hussein's soldiers threw newborn babies out of incubators in a Kuwaiti hospital and left them to die. The "discovery" so outraged the American public, it helped generate public support for turning "Desert Shield" (originally sold as protection of Saudi Arabia from a phantom Iraqi attack) into "Desert Storm." There was only one problem with the story: none of it was true. The weepy nurse was actually the daughter of the Kuwaiti ambassador to the U.S., carefully coached by PR firm Hill & Knowlton, which had cooked up the hoax. The American public opinion had been taken for a ride, and the result was thousands of dead Iraqis, burning oil wells - and a Short Victorious War for Bush the Elder. In the 12 years between "Desert Storm" and "Iraqi Freedom," the near-total blockade of Iraq imposed by the UN at U.S. insistence reportedly killed half a million Iraqi children. Madeleine Albright, U.S. Ambassador to the UN and later Secretary of State, said that mass murder was "worth it." A dozen fictitious Kuwaiti babies, invented by an American PR firm, were used to kill half a million real children - and that's not counting the deaths following the March 2003 invasion and the subsequent occupation of Iraq. Those civilian deaths have been estimated at anywhere from 18,000 to 100,000, and growing daily. There hasn't been any real soul-searching about this; people do not want to confess to being fooled. So of course, it happens again, and again, and again... "Weapons of mass destruction," anyone? Anyone at all? So it should come as a shock to learn that there were babies who died in their incubators, but who had the misfortune of being born on the wrong side, of the wrong nationality. They didn't have Hill & Knowlton publicizing their plight - but rather working to bury it, alongside another PR firm, Ruder Finn. 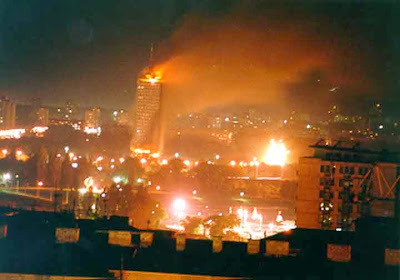 In the spring of 1992, when the government of Alija Izetbegovic declared independence of Bosnia-Herzegovina and civil war erupted throughout this former Yugoslav republic, the maternity hospital in Banja Luka ran out of oxygen for their incubators. The region was cut off from any friendly territory; there was no way to bring in the oxygen. Twelve babies died. This fact, well-known in Bosnia, is virtually unknown in the West. A Google search reveals only three mentions of it, two in ICTY transcripts. Then in mid-February, a Serbian paper published an appeal: save Sladjana Kobas, the 13th baby! Apparently, not all the babies in Banja Luka died. One managed to survive. Now she has bone cancer, which has already spread to her lungs (weakened by the incubator damage, along with her eyesight). Doctors everywhere told her she might live, but had to lose a leg. Only a hospital in Florida said the leg could be saved. After the appeal, a big fundraising drive in Serbia secured the $100,000 needed to get Sladjana to Florida. But they could not get her a U.S. visa. The U.S. Embassy in Belgrade says it sympathizes with the Kobas family, and is doing everything within the law to help. But Sladjana has already missed her window; according to her father, saving her leg is no longer an option. The cancer has advanced too far. For 13 years, Sladjana Kobas has been a living reminder of the real incubator babies, a story no one in the West wanted to hear. Slim as her chances are, they were worse in the spring of 1992. She survived then, and here's to hope that she will survive now. Maybe that's impossible in this world of rules, regulations and politically expedient propaganda. But it would be justice. Post scriptum: Sladjana Kobas passed away on February 10, 2006. Man what a great text!!! My best regards to you!!! We will not forget those 13 babies never!! !